It’s only 9:36am and I’m already nearly cried out. Today is the first day of school. Lily, my baby, started Kindergarten. Here come more tears! Guess I wasn’t cried out after all. Three years ago, when the boys started Kindergarten I cried. I cried then because life was about to hit a dramatic shift. I’d never known what it was like to have only one child at home. 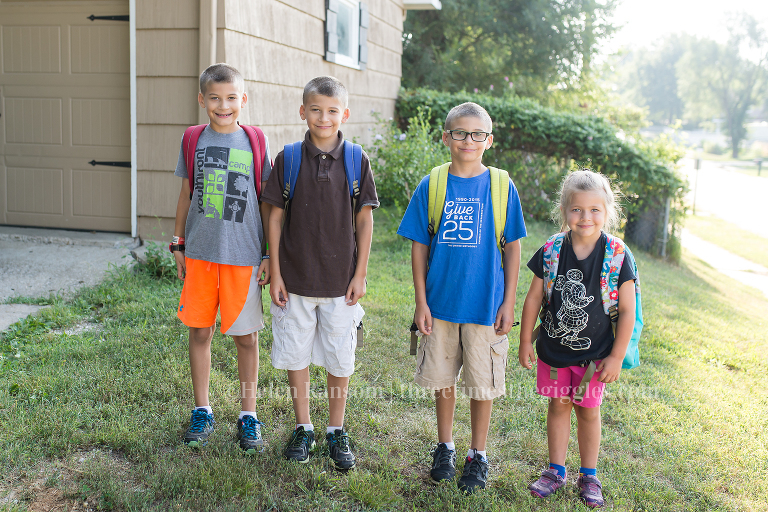 I couldn’t fathom that my preemie baby boys were finally old enough for elementary school. My emotions were running high. By the time Nick, Lily and I had walked back to the house though, I was fine. Today? Today is something else. I’ve known since December that I was going to cry on this day. In December Nick and I talked about how we couldn’t believe Lily was going to be turning 5 the next month, and that she would then be old enough for Kindergarten the next school year. 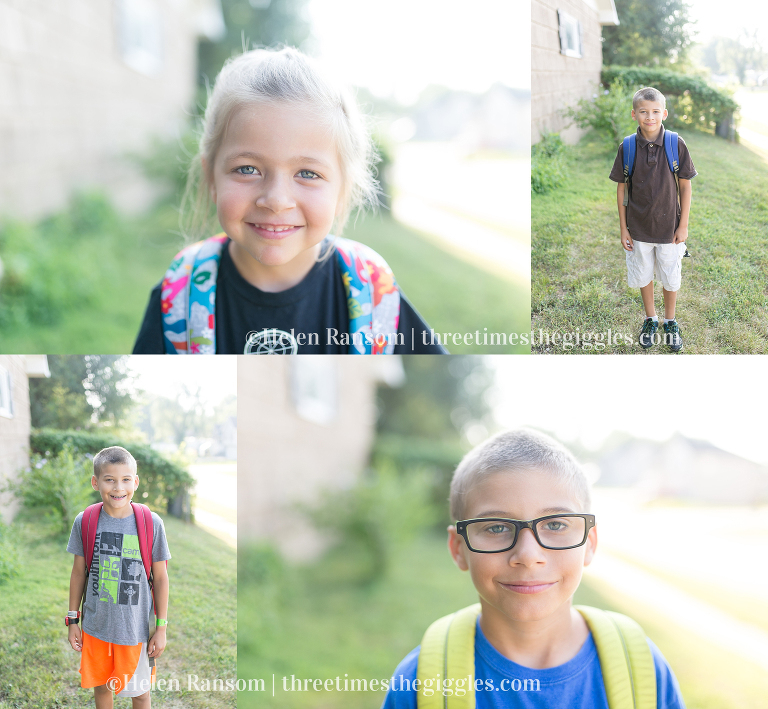 We both now had first hand experience with just how fast time does indeed fly once your children are school age, and it terrified me to think that all 4 of my children would now hit that milestone and time would begin to fly at warp speed. I started out ok today, but then shortly after getting up I read this Back to School prayer that our church’s Children’s Ministry team posted. Uh oh – a few tears might have welled up. I was fine as I took pictures of the 4 kids in the yard. I was fine as we walked to school (and I might have hurried them a bit, because pictures took longer than I thought, and we couldn’t be late on the first day!). When Ty held on for an extra long hug in front of the school, I felt the emotions kicking in. My baby boys are THIRD GRADERS!! They’re halfway through elementary school! They’ll receive their third grade Bibles at church this fall. They’ll probably have more homework than in the past. I just can’t. Thank goodness they let me buzz their heads one last time last night, because that at least helps them look a bit younger to me. 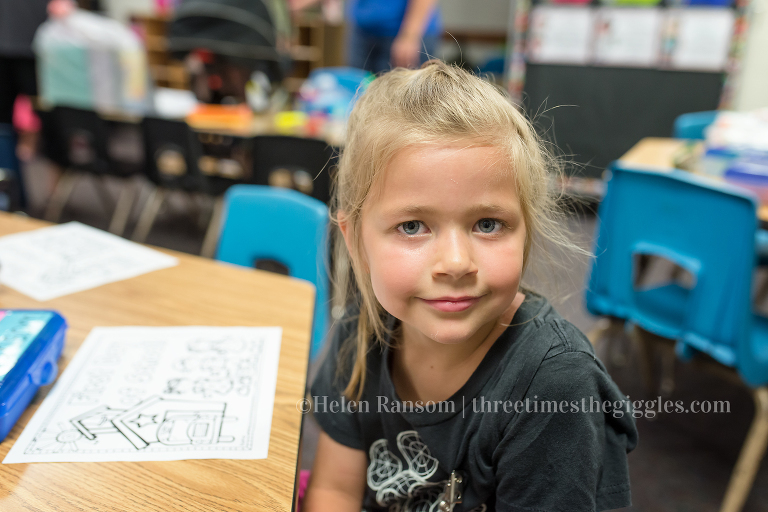 We walked Lily through the doors and down the hall to her Kindergarten classroom. We watched her wrestle her lunchbox out of her backpack and put it on a shelf. We watched her hang her backpack on a hook, and then we found her spot at a table. She was in Quiet Lily mode, but she often is in a new environment. I know that in no time she’ll be giggling, making friends, and having a wonderful time. I gave her one last hug after taking pictures, and immediately felt the tears coming. “Have a great day, sweetie. I love you so much!” I tried to keep my voice from shaking, so that she wouldn’t catch on to my emotional outburst. I quickly stood up and turned away, while Nick hugged her goodbye too. Out in the hall I held it together, but not well enough because my friend Monica immediately said “oh, honey!” and wrapped me in a hug. The tears. Oh, the tears. On the walk home those cliche sayings that moms hate to hear when in the check-out line at Target, or while a kid is melting down on the floor at church, or when you’ve vented on FB about how bonkers your kids are driving you, came flooding back. Enjoy this – time flies so fast. The days seem so long, but believe me, the years are short. There is no room for regret and “I wish” statements in my heart and head right now. I just can’t let them in. Right now, I’m focused on the end of this era. My purpose for the last almost 9 years has been the every day care of these children. Now, M-F from 9-4 someone else has them. Honestly, it’s no wonder so many SAHMs have an identity crisis for a brief time when their baby heads off to full time school. People ask me what I’m going to do with my time now, and the answer is invest most of it into my photography business, and volunteering at church and the school. I’m sure it’ll be filled in no time. In fact, I’m going to go throw myself into my work right now, in hopes that it eases the emotions and heartache. If you run into me today, and see me all red-eyed and looking like a hot-mess, now you’ll know why. I’ll make it through these tears by the end of the day, and in no time at all I’ll be joining the “seriously, another early release day? !” club. For now, I grieve the end of an era.